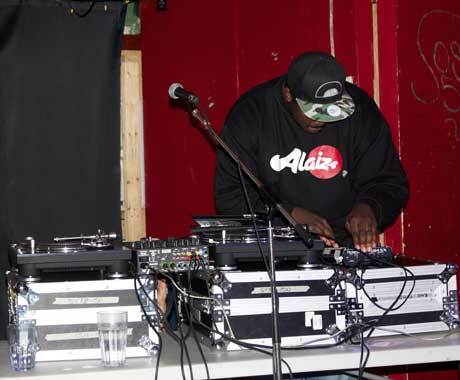 Hailing from Guelph, ON, producer Elaquent is a consummate beathead. With faultless J-Dilla inspirations, dude known as eQ is perhaps the standard "more known abroad than local" type of artist, which is a shame because he's doing things. His recent Parallel EP is proof of this, as was his execution of cuts from the project on this night (shout out to the Janet Jackson "If I Was Your Girl" reworking). It was hard to say if the hip-hop instrumentalist was feeding off the crowd or lost in his own musical space during his set, but it probably was a bit of both. It's obvious that he's a craftsman, less focused on mere sampling of neo-soul, classic rap and electronic elements and more about the overall musical composition. Parsing a technical performer like Elaquent (and Canadian contemporaries like Kaytranada) is about recognizing that it's not just about "doing beats" — it's an atmospheric thing comprised of disparate, layered sonics constructed in a way that feels as effortless as it is impactful. In this respect, his short set was tranquilly successful.